From the Studio: Gonzaga University Theater Presents " Mr. Burns: A Post-Electric Play"
We had a full morning of theater in our studio today, starting with a visit from members of Gonzaga University's production of Mr. Burns: A Post Electric Play. Director Charlie Pepiton and cast members Nathan Patrick Nelson, Annika Perez Krikorian, Mitchell Gomes, and Daniel Martin talked to Verne about their experience with the dark comedy by Anne Washburn which is inspired by the "Cape Feare" episode of The Simpsons. 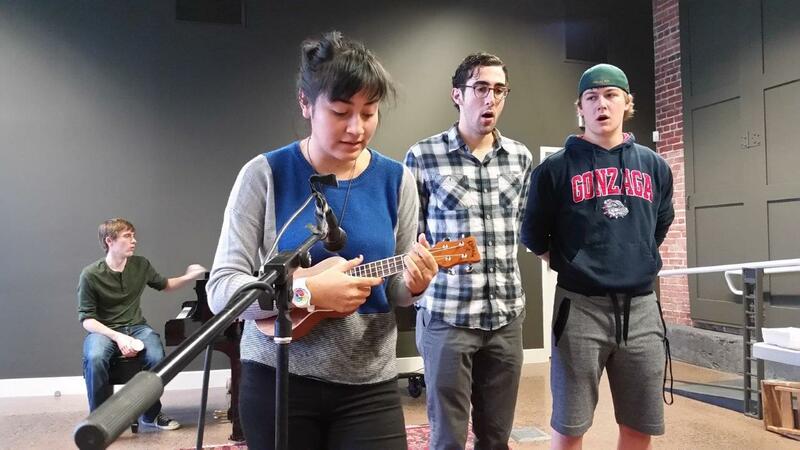 The cast also performed a couple of numbers from the show live in our performance space. Mr. Burns opens November 10 at 7:30pm at the Magnuson Theater. More information and tickets available from the Gonzaga University website. Verne interviews cast and crew of "Mr. Burns"